In this section, you can find the most recent and interesting updates from life at Chateau Heralec, offering great activity and sightseeing tips at all times. There are so many things to do and places to experience at the chateau and its beautiful surroundings that you will never feel bored. Take a look! For some time we have noticed that more and more of our clients have electric cars. 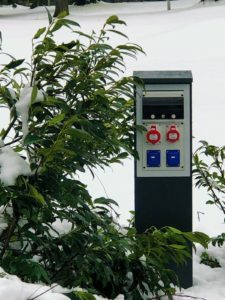 To make their stay even more comfortable and pleasant we have built in the parking lot an electric charging station, which enable two cars to fully charge their vehicle. If the owners of the cars will need to charge their vehicle, they can safely leave it in the charging station and comfortably enjoy the hotel and relax. Upon your departure, you leave fully re-charged with energy and feeling refreshed with a prepared car. Cheerful and absolutely original are our new castle sneakers! When we found the brand Tikoki and found out that young and ambitious people are behind it and they will be able to make sneakers for us, that emphasize our brand qualities, we knew we need them right away. 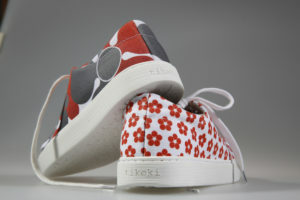 Our sneakers are based around our logo „The Herálec rose “, which you can find in some form in all four designs. They are available for you to buy directly at the hotel and we cannot imagine this year’s summer without them! Did we inspire you? The third edition of our table calendar for 2019, is dedicated to our favorite recipes from our kitchen. This way our guests can let themselves get inspired by our recipes and try it out at home, which is primarily sweet desserts because we love desserts! We start the year with our cacao cottage-cheese cakes and sweet bread rolls, which are regulars during our breakfast set up. In the calendar, you will also find the recipe for our homemade macaroons, which grace almost every dessert on our menus. We cannot forget about iconic de-constructed apple strudel and magical cheesecake from Bernard beer from nearby village Humpolec. Also, do not forget to taste our amazing potato gnocchi and cottage-cheese dumplings and some other recipes, like our delicious elderberry syrup. The calendar ends with our favorite muesli cookies, which we serve with our coffee. The first Chateau Herálec calendar from the year 2017, was based around our wonderful staff, with who we wouldn’t be where we are now. People of Chateau Herálec represent what is really important in nowadays in hospitality: feeling of comfort, friendly atmosphere, where every guest is welcome and feel that people at the castle are willing to do anything to make their stay comfortable. Our second calendar from the year 2018 was dedicated to our English park and his wonders, which wonderfully gets integrated with our park guide. We decided to buy a defibrillator after the castle lady Mrs. Alexandra and her daughter Karolina took part in a First Aid course. Every day more than 2500 people die due to heart failure. Automated external defibrillators (AEDs) can save a life because the faster you provide help, the chances of survival are higher. In a case of heart failure, the heart starts to fibrillate and the blood flow stops. After 4 to 5 minutes from the heart failure, the brain cells start to die, which is why a fast reaction is crucial. The first step is to call the ambulance by calling 155 (or 112) a right away start the resuscitation with the help of the AED. 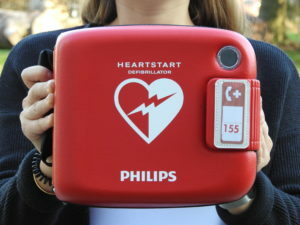 All our receptionists are trained, but the beneficial factor of the AED is that it is designed that everyone, even without training would be able to use it. The AED while in use shows you how to use it with pictures and verbal instructions. We are happy to announce that we are even included in the map, where all AED machines are placed around the Czech Republic. Through the eyes of the great photographer, Vladimír Kunc, you can also get a chance to look at the wonders of the Czech cities and nature. 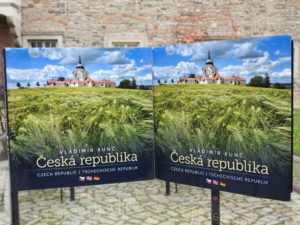 His decision to release a book that maps, not only the beautiful nature of Vysočina but the magnificent castles that are all scattered throughout the Czech Republic. We had the honor to launch the book at the castle, which is published in 3 languages, so it is the ideal present for your loved ones or friends. Everyone that opens this book, should be proud from where they come from and if you are just visiting, it will definitely be a nice souvenir. We highly recommend it! In the first days of September 2018, we started something that we have been preparing for more than a year. The new thing that will be waiting for the guests upon their arrival to the rooms is fruits from the orchard. According to the season, we will prepare apples from our set in Morava, pears, cherries, plums, etc. as they will naturally mature nicely. Fruits are lovingly harvested for you, and if we do not have enough supplies, they are helping us out from the nearby Bohdanca orchards. All the fruit is of organic quality, we treat it kindly from bloom to ripe fruit. Maybe the apples are still scrutinized, and those that have been infested by the worms are processed carefully in the kitchen into our already iconic apple tart. Well, and the most beautiful ones are going to be polished and carefully prepared as a welcome greeting for our guests. Hope you will enjoy this treat! 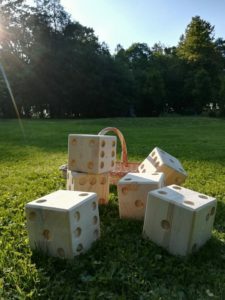 For our playful guests, we have made these giant playing dices from the local joiner, the basketry from Pelhřimov is a nice basket for you to easily carry the dices to the park. We have two playsets ready. We have a protective coating on the cubes so that they do not fall apart throughout time… so make sure you hurry up to play with them. The score of the game can be written on a black chalkboard, and we are also happy to prepare a small snack for you, upon your request. Due to the size of the cubes, it is necessary to throw it one by one, which leads to the game to be very long, but time in the castle goes by slower. We recommend some good drinks, as well as some sparkling white wine. Out of our white wines, definitely worth trying out is our Sauvignon Blanc from Mr. Fabio of Hustopeca, who has learned to produce the best Sauvignons in the “kingdom” of this variety, which is no other country than New Zealand. Then you can celebrate your win in cubes with some of the great sects from Mr. Prokeš from Velké Němčice, which are made using the classic method as Champagne. For us, these are some of the best sects that have been born in Moravá. We visited Mrs. Kateřina Pešková, who produces fantastic goat cheeses for us. 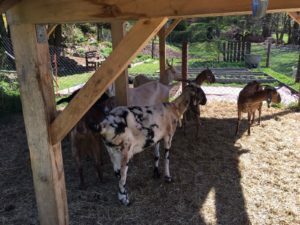 The season is at full speed, and with goats’ grazing at the family farm in the Wolf Hills. The cattle have been added to the herd, which catches the mothers and the family dog. Mrs. Katka, who lives with her family alone in the woods, is a mother of 3 children and even in the season gets up early in the morning and goes to sleep almost at midnight, is always full of energy. This beautiful woman refused to take photos, so we bring a photo of goats: she chose Anglo-Nubian breed for breeding. Its advantage is that the milk from these goats does not smell like “goat” milk, so the occasional argument of the opponents of this healthy delicacy. Additionally, as a graduate of a prestigious graphic school, she has brought art to the production of cheese: when you pull out a glass of “cooked” cheese hearts, you have to be enchanted. We just love her cheeses! Goats live in the middle of pure Vysočina nature, Mrs. Katka put her heart not only into the care of animals but also into production itself. Introducing our new Chateau Herálec Gourmet food range! 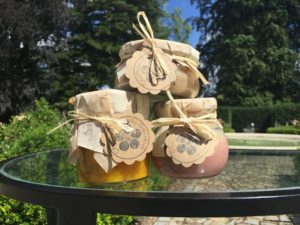 Finally, our new Chateau Heralec Gourmet – all the great pates, rillets, pickled cakes from the field under the granary, smoked duck breasts and lots of other delicacies from the castle kitchen can be taken home. Homemade jams are also available, and a tip of our chef Michal is the great rhubarb with oranges jam. And, of course, our classic popular pin jam. They also taste good dairy delicacies from the Eagle farm, their homemade cheeses, and mammans … These products are now supplemented with fresh flour from the family mill in Střížov, which is available in 3 different variants, great baked muesli from Janov’s oven, dried fruit from Mrs. Kubova, or homemade honey from Mr. Brabence of Herálec. We try not only to offer our guests home quality but also to support local suppliers and manufacturers. We deeply believe that this mutual assistance benefits everyone. We look forward to your next visit! For our youngest visitors, we have created a beautiful collection of castle animals from our specially printed materials in cooperation with the CZPINS sheltered workshop that employs people with physical disabilities – a teddy bear, squirrel, an owl. With the exception of the teddy bear, all animals are residents of our château park. If you go for a quiet walk through the park, you will surely meet them there… The cute squirrels in the form of small pillows for dolls and large plush pillows will surely delight all children. For the very smallest, we have prepared a beautiful and cheerful owl. Dear guests, we are very proud to introduce our new exceptional blankets. When we discovered a traditional manual production facility with a long family tradition located in Vysočina where they only work with natural materials, we were thrilled! Furthermore, everything that comes from the artistic weaver in Strmilov bears the seal of both high-quality craftsmanship and a sense of detail. The Kubák family has been focused on weaving for 6 generations now. The youngest promising member of the family businesses is the likable and hard-working Filip who studied textile design in Jihlava and later interned in a textile art workshop in Austria for a year. Together, we have created up to 5 designs of exceptionally large blankets that will stand out in any interior. The blankets are woven from 100% wool, which is processed in Strmilov from fleece. Then comes its brushing, spinning, yarn dyeing ….our château blankets were woven on the widest loom and then specially wrapped. To top it all off there are hand-knotted fringes on each blanket. Indulge yourself in quality of the highest class, which not only warms you but also pleases with its beauty. 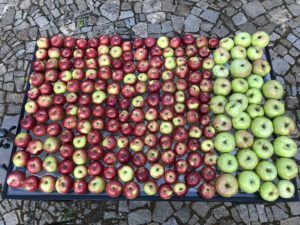 Every year during the autumn season we say goodbye to the fruits of our harvest at the castle. We are grateful that our harvest is always very rich thanks to our gardener James. Our pumpkins of different varieties are the best proof. They grow into truly gigantic proportions under the castle granary and many a gardener would certainly feel a pang of envy. Not only do they serve as great decoration in the castle courtyard, but they can also be enjoyed in our annual autumn menu. Whether in the form of a delicious soup or fun Halloween night activity, these orange beauties light up even the dullest of autumn days. Come see for yourselves! In early September 2015, we launched the new endowment fund for a better chance for children from the village school in Herálec to improve the educational environment of primary school children in the local Herálec elementary schools. We have already participated in the project of AHR ČR (Association of Hotels and Restaurants in the Czech Republic) “Start in life” and supported disadvantaged children from orphanages. The objective was to effectively involve these children in hotel work and thereby make their entry into everyday life easier. But we felt that given the nature of our operations in Vysočina, we should be more involved in supporting children right here in our region. The endowment fund for a better start of children from the village school in Herálec is a non-profit organization, which only receives funds as a voluntary cash donation from hotel guests in a symbolic amount of 25 CZK. The sum received is used to support projects focused on the all-round development of the village school, its pupils as well as the teachers. To be precise, the endowment fund will finance projects promoting the development of teaching, material school equipment, teaching aids, as well as school and extracurricular activities, including leisure activities for children. Donations will be used to support teachers in deepening their qualifications. Smaller schools in villages generally struggle with a lack of funds and any financial means can help them improve educational conditions for children. Education is the key to the future. It is therefore important that children from villages are given an equal opportunity for quality education as children from larger cities are.